Travel Accident Insurance - provides automatic, free coverage of up to US$ 500,000 against accidental death, dismemberment or paralysis when traveling with a commercial carrier once the tickets are purchased (in full) with this card. Coverage shields the cardholder, spouse and unmarried, dependent children. Auto Rental Insurance - Insurance coverage of the damages to the rental vehicle due to collision, theft, vandalism, accidental fire for a rental period of up to 31 days. The customer must initiate and pay for the rental in full with this card and decline the Collision Damage Waiver or similar coverage; all drivers must be included in the rental agreement. Emergency Assistance Services - Receive assistance anywhere in the world, by calling the Visa Customer Service Centre. Customers travelling outside of Jamaica, receive access to Emergency Card Replacement for a lost or stolen card. 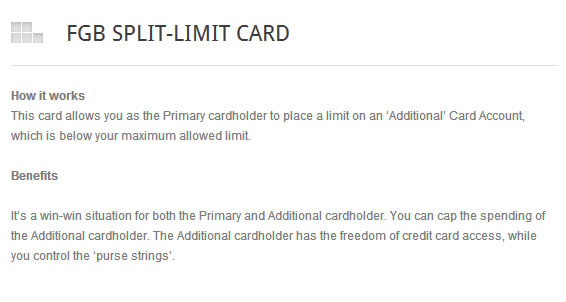 Split/Shared-Limit Card– allows a primary cardholder to allocate a portion of the entire account limit to an additional card. 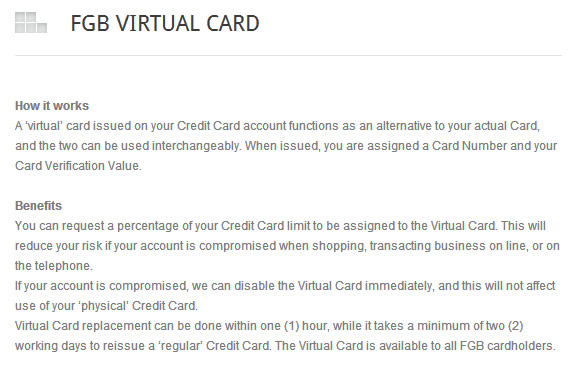 Virtual Card– Designed to reduce the risks associated with shopping online, the virtual card is ideal for online or card-absent shopping and has a limit that is a percentage of the actual card limit. You deserve only the best and the FGB Visa Platinum Card is just that! An exclusive international card designed to give you top-of-the-line purchasing power, premium services and superior benefits. This luxury card is denominated in US Dollars and is the most convenient option for international spend or while travelling.